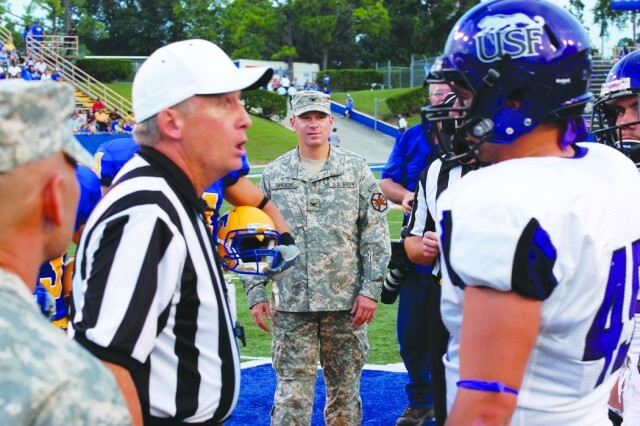 LAKE CHARLES -- Fort Polk Soldiers, as well as service members from the Air Force, Navy and Coast Guard, were lauded during Military Appreciation Day at McNeese State University's home football opener against Sioux Falls University Sept. 17. Activities for service members and their Families began before the game with a tailgate party featuring jambalaya, beverages and entertainment by the MSU dance line, the Cowgirl Kickers. Petey Miles was one of the volunteers who served food to Soldiers and their Families. "After all they (Soldiers) do for our country, this is miniscule," said Miles, who works at Ingle Real Estate. "These Soldiers are younger than my son. One 22-year-old guy said he'd already been to Iraq twice. I told him, 'I bet your mother is tickled to death to have you home.'" Miles said she and her fellow workers chose serving as volunteers during Military Appreciation Day as a community service project. "We do appreciate them," she said. "We can't tell them enough." Lake Charles Mayor Randy Roach was on hand to greet service members during the tailgate party. He said Military Appreciation Day is important because the Army is important. "Whatever we can do to show them we appreciate and support them, we'll do," Roach said. "We want to build on our relationship with Soldiers and Fort Polk not just for football games, but at all times. It's important they and their Families understand we appreciate the sacrifices they have made." After the tailgate party, participants moved to Louis Bonnette Field at Cowboy Stadium for pregame activities and the official coin toss. Fort Polk Garrison Commander Col. Roger Shuck joined representatives from the Army Reserves, Louisiana National Guard and Coast Guard in the coin toss. Those in attendance were treated to a flyby as two F-15C Eagles from the Louisiana Air National Guard's 159th Wing from Naval Air Station New Orleans zoomed overhead at 1,000 feet. 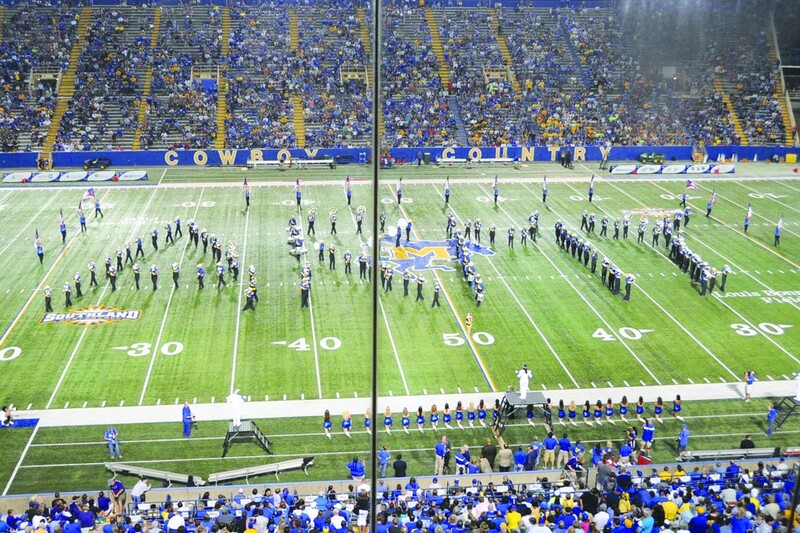 Other activities included a stirring halftime show featuring songs representing each service by the MSU marching band, the Pride of McNeese. The band spelled out the name of each service as they played its song. George Swift, president and CEO of Southwest Louisiana Economic Development Alliance, was one of the driving forces in establishing Military Appreciation Day at MSU. He said the entire southwestern region of Louisiana wants Fort Polk's Soldiers and Families to know they are welcome. "We want to further our ties with Fort Polk and its Soldiers because of the importance of our nation's defense to the local economy," Swift said. "We want to promote cooperation with Fort Polk and work together." The Cowboys made it a perfect night by claiming a 31-17 victory over the visiting Cougars. Fort Polk Garrison Commander Col. Roger Shuck thanked officials with MSU and the city of Lake Charles for their hospitality. 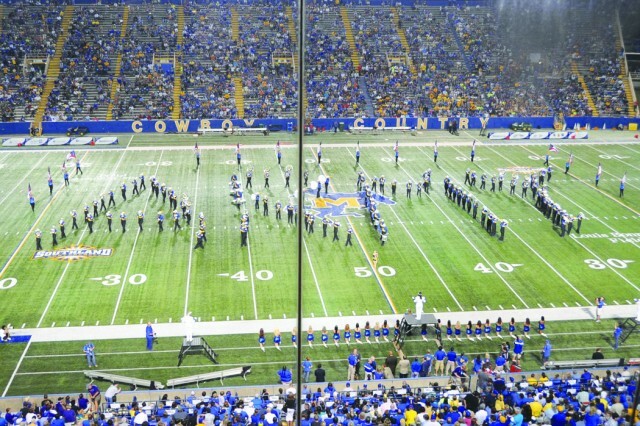 "I'd like to thank McNeese State University and the city of Lake Charles for the special military appreciation night held during the MSU football team's home opener against Sioux Falls University," Shuck said. "The tailgate party, as well as the chance to participate in pregame activities, let our Soldiers know how important they are to the people of southwest Louisiana. These types of events serve to strengthen ties between Fort Polk and area cities and towns. We look forward to continuing our relationship with Lake Charles and McNeese State University and wish the Cowboys the best of luck in the remainder of their season."